CCPI Europe is happy to announce that it has signed the license agreement with UK’s National Measurement Institute (NMI), the National Physical Laboratory (NPL), for the self-validating thermocouple or INSEVA. On the 15th May 2018, representatives from CCPI Europe visited NPL (Teddington, UK) to formally sign this exclusive licence agreement for the new revolutionary INSEVA (Integrated Self-validating thermocouple) technology. This state of the art, new technology operates by employing the same principles as used in thermal calibration laboratories for the highest level of calibration, i.e. the fixed-point method of calibration. The reliable melting/freezing point of pure metal and more recently metal carbide eutectics, are used to calibrate thermocouples at set fixed point temperatures. The “INSEVA” thermocouple incorporates the fixed-point calibration techniques, so a calibration on the thermocouple in situ reading can be made when required, while still behaving like a conventional thermocouple assembly. As the environment temperature passes through the fixed-point melting/freezing point of the material, the thermocouple voltage reading ‘hesitates’ as it transits the melting/freezing point of the material. 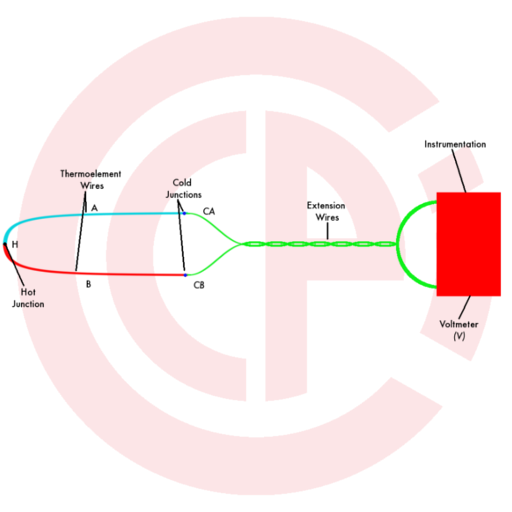 The reading from the thermocouple can be then checked against the temperature, as the true temperature can be determined from the melting/freezing point of the material, and a measurement can be made which can be used to account for the calibration accuracy / drift of the thermocouple. What causes drift in Thermocouples?